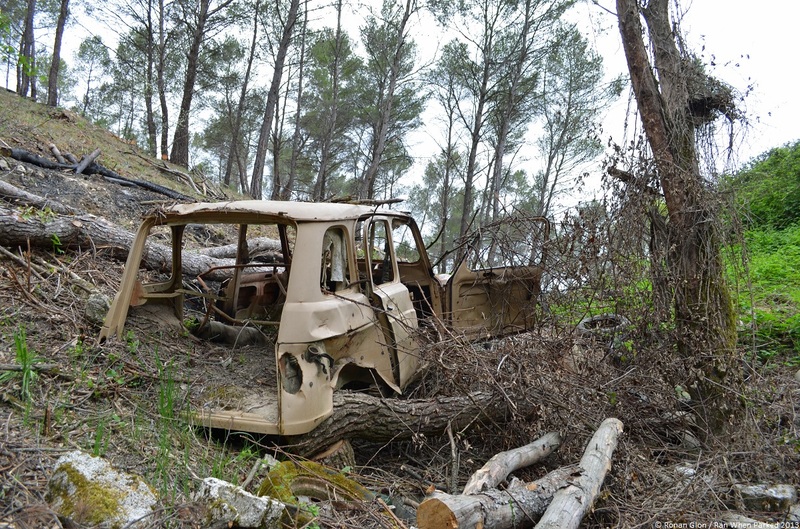 We hiked for a few minutes to photograph a forlorn 1960s Renault 4 that we’ve known for years, and we were surprised that the ditch it’s in has been cleaned of all of its wild brush. While that certainly helped us take clearer pictures, it also revealed many more cars that we had previously missed. The first one is also a Renault 4. It was previously buried under so many fallen trees that we had never even caught a glimpse of it and, in retrospect, probably walked right over it several times. Like the 4 that initially caught our attention, this example has been stripped of absolutely all of its usable parts as well as anything that could be used to identify it – there is no ID plate in the engine bay, no VIN number and no registration number anywhere. A little bit of automotive achaeology revealed that we’re most likely looking at a 4 TL built in either 1976 or early 1977. The paint code sprayed on the inside of the fender is 111 which corresponds to a color called Daim that was offered on and off in the 1960s and 1970s on several members of the Renault lineup including the 5, the 6 and, of course, the 4. That doesn’t help us, we know that it can’t be any newer than 1981 because the door hinges are visible, but there are several other clues including the round bumpers (as opposed to the tubular and later flat ones of the 1960s) as well as the two curved air vents below the windshield inside the car. Last but not least, the 4 is still equipped with the flip-up air vent below the windshield that was replaced by a plastic unit that didn’t move in 1977. Surprisingly, the passenger side tail lamp has been cut right out of the sheetmetal and part of the car has been recently set on fire. That said, it’s in considerably better shape than most of the other vehicles that are ending their lives further down the ditch.